Morrison has announced the addition of the new 610 Urethane Hose Hanger to their product line. Able to hold either 1″ or 3/4″ hose, the hanger is designed for heavy load-bearing and compression capacity, as well as to resist tearing, cutting, and abrasions. Customers should be aware that the introduction of the 610 hanger shall coincide with a part number change, with the previous 610BUN0100 changing to 610HGR0100. 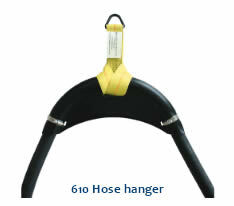 In addition, both the 610H-0100 AR and 610HB-0100 AR hose retriever kits will now include the 610 hanger. You can find out more about the 610 hanger, as well as other products in the 610 and 611 hose retriever series, by reading the official product brochure.